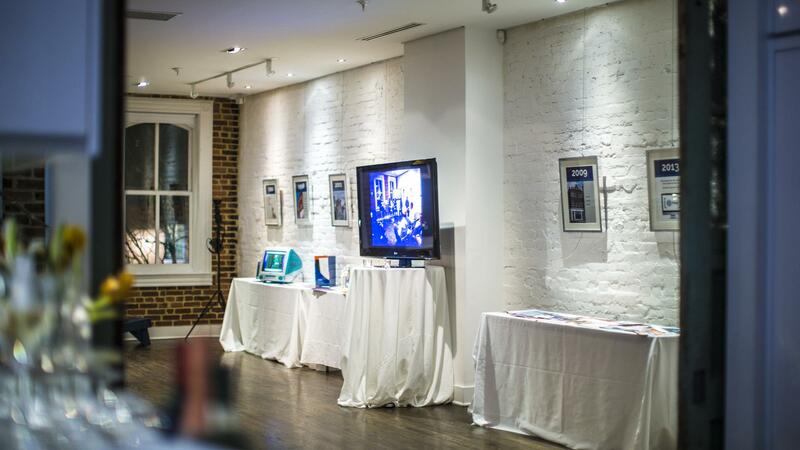 Rent Fathom Gallery | Corporate Events | Wedding Locations, Event Spaces and Party Venues. Fathom Gallery is a multi-level, flexi-use event space located on 14th Street in the heart of Logan Circle that boasts a 2500 sqft outdoor rooftop garden just outside the 1250 sqft gallery space. Fathom Gallery is a multi-level, flexi-use event space located on 14th Street in the heart of Logan Circle that boasts a 2500 sqft outdoor rooftop garden just outside the 1250 sqft gallery space. The Gallery combines the classical elegance of old 14th Street with a refreshing, modern simplicity. The space is an ideal venue for art shows, cultural exhibitions, fundraising events, non-profit events, cocktail receptions, special celebrations and weddings. We have hosted events for The National Trust for Historic Preservation, National Geographic, Google, Deloitte, and many others! Recent art exhibitions have featured artists Ned Dishman, Nima Veiseh, and Stephen Benedicto. Fathom Gallery is located in walking distance to three area metro stops and offers an array of dining, shopping and popular arts institutions right outside its door, making it the ideal spot for events in D.C.’s northwest corridor. All events serving food and/or beverage must select from a list of our approved caterers & mixologists.